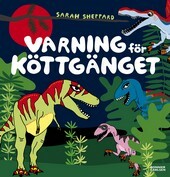 In her first book Sarah Sheppard took us to meet the different gangs of dinosaurs that ruled the earth for 165 million years. Now it’s time to concentrate on the nasty (to put it mildly!) characters in the Carnivorous Crew! The Carnivorous Crew is a big gang made up of seven horrible families. Among others, we get to meet the Spiny family, the Thieving family, and the Bullying family. Some were huge with sharp claws and teeth. Others were small, but fast and clever. And they were all scary! We also meet the “Carnivorous Cousins" in the air and in the water, and we dig a little deeper into the Jurassic and Cretaceous periods. With humour, fact and fantasy Sarah Sheppard presents lots and lots of fantastic information about dinosaurs!